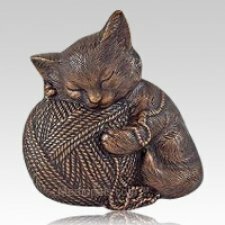 The Copper Cat Cremation Urn will add a comforting thought to your precious memories of your beloved pet. The cat urn is crafted with brass and perfected with a coating. "The urn is a beautiful product that represents your loving pet. "Excellent customer service. Speedy delivery. Wonderful quality product. All of these combined to make a difficult time a little easier. You exceeded my expectations by far Thank you so much!